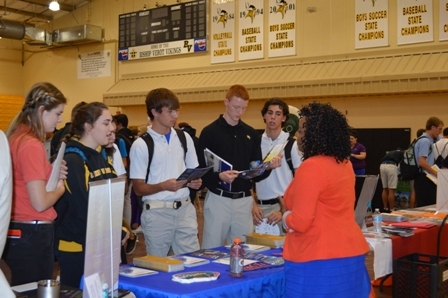 Bishop Verot Catholic High School was host to over 60 colleges and universities at one of Lee County’s largest in-school College Fairs. The event was held during the school day, with Michigan State University, Purdue University, Vanderbilt University, and Notre Dame University as well as numerous other colleges from around the state and the country in attendance. Students in 10th, 11th, and 12th grades were invited to tour the fair, speaking with college admissions representatives and gathering information. Students were able to learn about the rigorous acceptance requirements, the application process, and major areas of studies for the schools of interest to them.